Danielle Muntyan. OUGD603 Extended Practice. At this stage I had developed many more variations of the logos to date, featuring different sub-headers/details to highlight the profession. 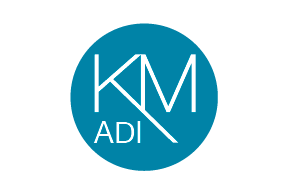 For example, the photography logos have been designed to have a 'lens' aesthetic, whilst the ADI logo has a sense of movement to the logo like a car wheel or steering wheel, imitating the action of movement. 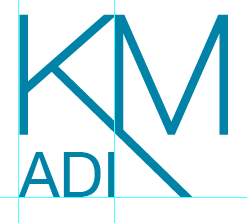 I also continued developing a more basic, and design focused logo, where the K and M are merged. 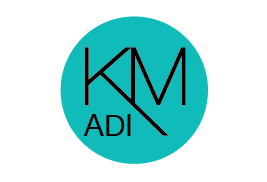 I feel this is the stronger graphically and visually out of the two styles of logo put forward to Karen. I also felt the two different styles should be worked with in colour at this stage to see how this affects the readability and legibility of them. I also feel by introducing colour, this may sway Karen in a particular direction with the design and aesthetic she would like to pursue. Karen's new car is white, so she is almost starting totally fresh. She has specified she would like to see purple and blue being introduced into the design which relates to her 3rd business as a Utility Warehouse Manager, allowing some continuity across her professions. However, she is open to seeing other colour options too, so I have selected a series of colours to show to Karen and experiment with when it comes to further development. Hi! Bless you. Thank you. 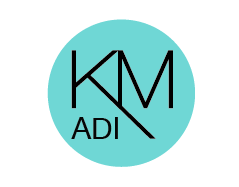 From our conversation, I worked on using 2 blues, one being more of a teal, black and white within the logo design Karen had said to develop further. At this stage, I decided that the letters needed to be bolder, allowing the ADI to be more readable and legible at different sizes and when on the road (car vinyl, etc). I also aligned this properly using a grid structure shown below. Two logos have been developed at this point in slightly different colour variations. Based on Karen's feedback to these the photography subtitle will be introduced and worked with.